Nestled in the slopes of the Kaimai Mountain Ranges, Rod and MaryAnne Calver would like to welcome you to Aberfeldy Farmstay. As a farm, the property is also home to a small contingent of Sheep, Pigs, Cattle and Horses as well as two pet Dogs. Guests are welcome to enjoy the fresh country air by going for short walks on the property, and even participate in simple farm activities for a truly authentic New Zealand farm experience. You are welcome to book either room, or both for larger groups. We can accommodate up to 5 guests. Please note we try to accommodate only one group at a time to give you total privacy. The well appointed queen plus single bedroom and generous private lounge area both open out onto the courtyard and garden. You also have your own outdoor dining table where you can relax in the warm summer climate the area is know for. In the cooler months you can bask in the warm winter sun late into the afternoon from the comfort of the private lounge. Aberfeldy Farmstay & BnB. We have two accommodation options. This is the Queen + Single bed configuration. The well equipped Queen + Single bedroom opens out onto the private courtyard and garden. Single window-side bed looks out into the garden. This is one of the two single beds in this twin single configuration at Aberfeldy Farmstay and BnB. The two beds are well spaced giving a sense of privacy within the room at Aberfeldy Farmstay and BnB. The top floor is our home, and the bottom floor is a private BnB accommodation available to guests. With comfortable furniture to seat a whole family and country decor, it makes for a cosy and welcome environment for guests to enjoy. Just outside the lounge in the courtyard is an outdoor table set overlooking the garden. It is a beautiful spot to soak up the afternoon sun. Pick up some takeaways from Katikati and head to this spot in the summer months. The lounge features many glass windows that look out into the garden and farm. Well positioned to make the most of the afternoon sun, this room is a delight all year round. 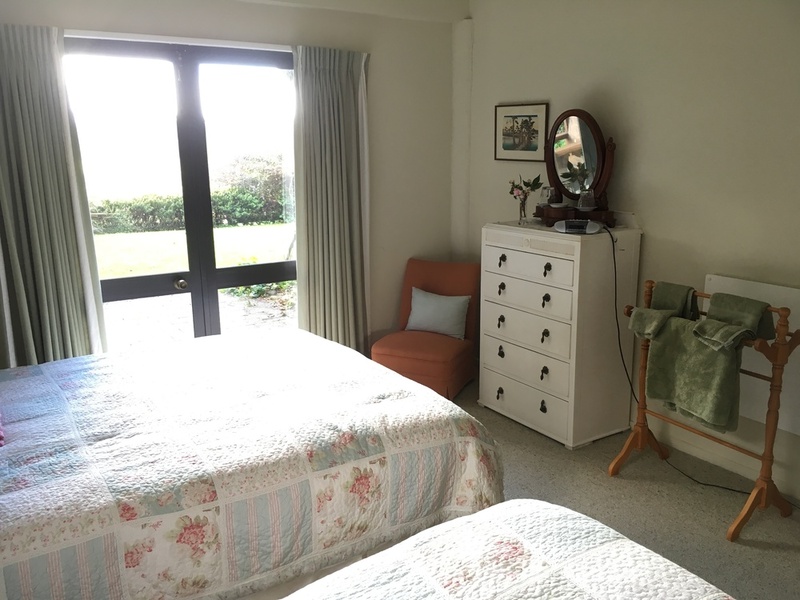 The private guest accommodation downstairs is an extension of our home, the decor has a classic NZ farmhouse feel to it and we have no doubt you'll feel right at home at Aberfeldy Farmstay BnB. With the garden courtyard in the foreground and farmland in the background, this view of Aberfeldy is a great snapshot of the tranquil setting that awaits for those seeking refuge from the hustle and bustle of New Zealand's main centres. With a large outdoor garden, Aberfeldy is a very child friendly BnB with lots to do both on the farm and in the wider Katikati region. 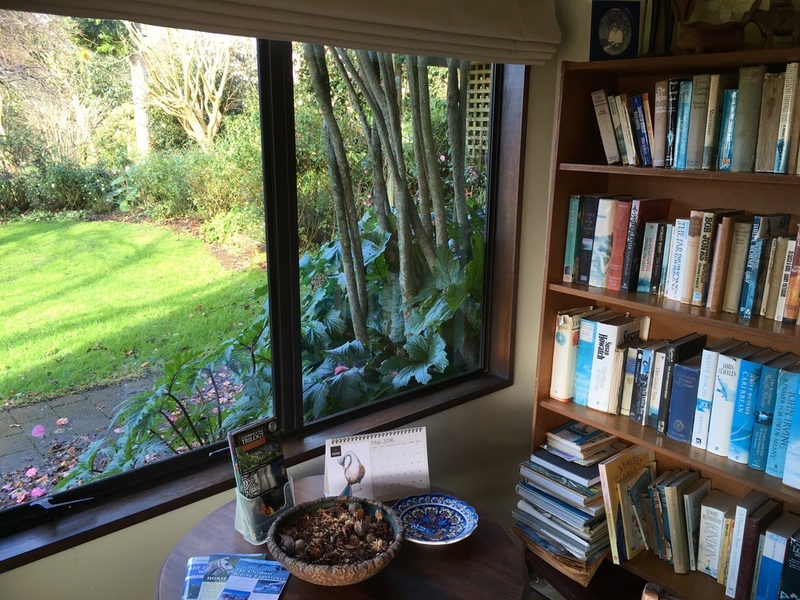 We have a small library of books available to guests, and more importany, a warm and sunny lounge in which to read said books. The Double + Single room opens out onto this cobblestone courtyard, enjoy a walk in the garden, or relax in the rustic outdoor furniture. We are one of the only pet-friendly accommodation options in Katikati, bring your dog for a taste of farm life. We have a fully equipped bathroom reserved exclusively for our guests. The bathroom is Shared by both rooms, therefore we only take one booking at a time for your convenience and privacy. The bathroom has a both a bath and a shower making it great for families with young children. Get comfortable at the end of the garden and enjoy the picturesque farmland views from this unique hanging chair. From the hanging nest chair at the end of the garden you will see this view of Aberfeldy Farm. 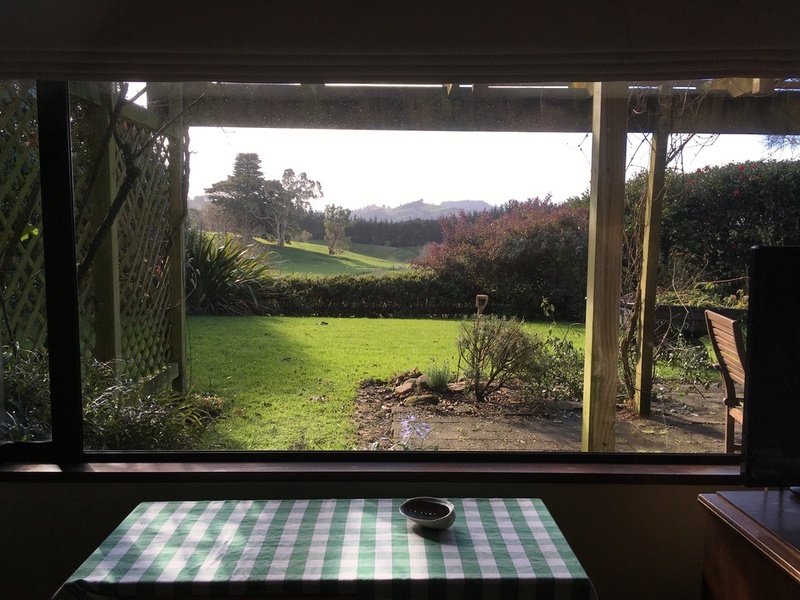 Aberfeldy Farmstay and BnB is located on Lindeman Road, famous for its sweeping views of katikati and the wider bay of Plenty and Coromandel. Rod and Monty in the sunroom. The views change from coastal farmlands, to harbour inlets to country gardens. One can relax in the company of MaryAnne and Rod upstairs in the sunroom or have the complete privacy of your own lounge with a rural view of the farm and garden. An utterly tranquil place to relax and stay. They don't call it a bed and breakfast for nothing. Rod is well known for his hearty cooked breakfasts, and we also we offer a range of cereals, toast and fresh fruit. We'll do our best to accommodate for special dietary requirements if you let us know in advance. Because of the downturn in the dairy industry we are no longer grazing dairy heifers, and we are now back to being a sheep and beef unit. Although the Horses get the best view on the Farm, they do have to work for a living. Horse riding is available nearby, and there are beautiful Bush Walks in the area including the Lindemann Loop. If you continue 2 km up the road to the end you'll find a lookout with stunning views of the Western Bay of Plenty. We have 2 pet Kune Kune pigs called Dotty and Piglet. Both love attention and food. We have an Australian Terrier called Monty who is allowed in the house and an elderly sheep dog called Pearl who would love to be allowed to come into the house as well! Both dogs will warmly welcome you on arrival. We do allow our guests to bring their own dogs to experience some country life. Our ageing horses still take us on some fabulous horse treks. The 2 horses we have now (Inkey and Blue) have both been as far north as Cape Reinga and as far south as Wanaka. They both love attention too-especially if its food. If you're not able to eat all of your breakfast our pet Kune Kune Pigs Dotty and Piglet will be on the job. If you are lucky enough to visit us at the right time of year, you may get to see some baby Lambs being nursed by their mothers. An abandoned lamb being nursed by MaryAnne. Note: we don't have lambs all year round. BnB Hosts: MaryAnne (Centre) and Rod (Right), in their sun room overlooking the Katikati District. Rod and MaryAnne have lived in Katikati for longer than either would divulge. Rod has been very involved in the Kiwifruit Industry (The leading industry in the region) since 1973, and is still a Zespri Ambassador. He is also a very community minded person and member of the local Rotary club. MaryAnne has a background in hosting guests on a small farm in Rotorua and is a self professed 'horsey person'. The garden is MaryAnne's territory, however Rod is known to prune the odd rose bush. The two have multiple shared interests including cycling, walking, travel, reading and horses.